The Daily Express can’t make the numbers add up !! The front page of yesterday’s Daily Express managed to combine glorious unintended irony with some really questionable reporting of statistics. AS you’ll see from the image above the lead story reported an opinion poll where 70% of respondents wanted all immigration to be stopped immediately. It’s quite entertaining that of three people pictured on the front page one was born in India and a second is the daughter of Russian immigrant parents (presumably of the three it is Simon Cowell that the Express are happy to have as a citizen !). Despite the glorious irony of the pictures, it’s the stats that I find really interesting. 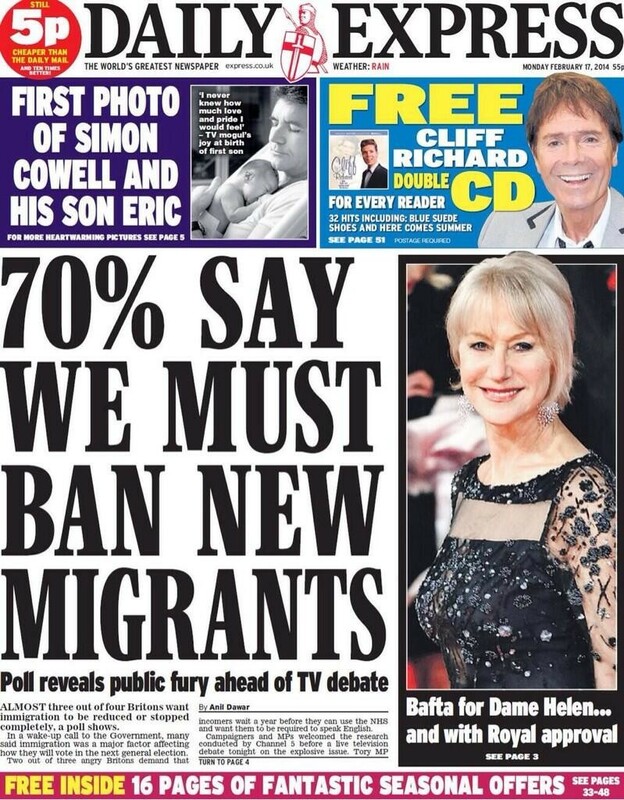 The stories headline is very clear that ‘70% say we must ban new migrants’, and yet the very first line of the story says ‘Almost three out of four Britons want immigration to be reduced or stopped completely, a poll shows’ (My BOLD). So, within the space of one line we’ve gone from 70% wanting a complete ban to 70% wanting a reduction !!! If you then look at the actual survey on which the story is based you discover that rather than 70% of respondents wanting an immediate ban on immigration the actual figure was 21%, with a rather 49% wanting immigration to be reduced. This seems like a lovely example to introduce students be being discerning consumers of the media, after all a contradiction between the headline and the very first line of the story ought to be easy to spot.